Josh Taylor has established himself as one of the best Super Lightweights in world boxing, having become the first man to stop former long-reigning IBF world champion Miguel Vazquez last time out in Edinbugh. The 27-year-old is ranked highly by the WBC, IBF and WBO and is fast closing in on a World Title shot. 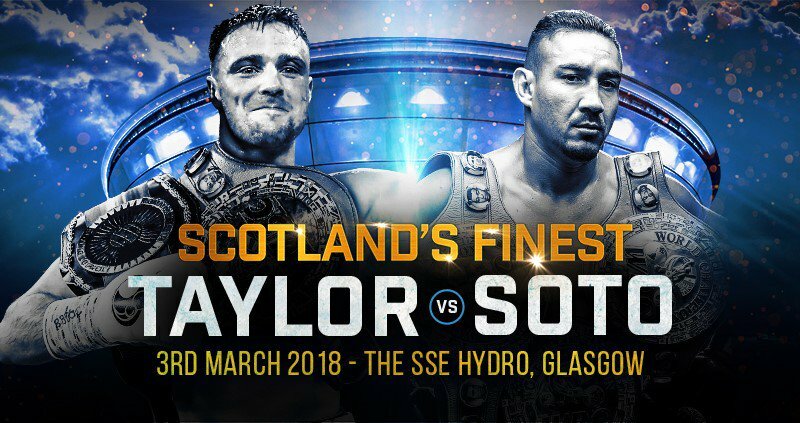 First, though, Taylor must overcome his toughest test to date against Soto on Saturday March 3rd at the magnificent setting of the SSE Hydro in Glasgow. This huge night of championship boxing on March 3rd is entitled ‘Scotland’s Finest’ and will indeed feature the brightest lights in Scottish professional boxing on a stacked undercard. Cyclone’s undefeated Jason Easton (11-0-0) will feature as chief support on the bill on March 3rd. The IBO Inter-Continental super-lightweight champion will box Sunderland’s Glenn Foot (21-3-0) for the vacant Commonwealth Super Lightweight championship, and this intriguing bout has ‘Fight of the Night’ written all over it. The all-action Easton has his hands full against former Prizefighter champion Foot, who also recently held the English title. Glasgow’s 2014 Commonwealth Games gold medallist Charlie Flynn (10-0-1) will make his eleventh appearance as a professional on the big SSE Hydro bill on March 3rd. The undefeated Lightweight will box in a six-round contest against an opponent to be named shortly. Scotland’s former amateur star Lee McGregor (2-0-0) makes his third start as a professional on March 3rd when he features in an eight-round contest on the undercard. Undefeated IBO World Lightweight champion Chantelle Cameron (5-0-0) will make her first defence of her belt against an opponent to be named shortly. The talented Northampton star will be looking to build on her title-winning performance in December when she stopped Brazil’s Viviane Obenauf. Airdrie based Congolese Heavyweight sensation Martin Bakole (10-0-0) will box for the sixth time in the UK as a professional. The IBO Continental champion will look to build on his impressive first-round stoppage of Belgium’s Ali Baghouz last time out in Edinburgh with another solid win on March 3rd. Elsewhere on the card, Glasgow’s undefeated Scottish Super Bantamweight champion Joe Ham will feature in a six-round contest and Edinburgh’s undefeated prospect Iain Trotter makes his sixth start as a professional on the big bill. The scene is set for a huge night of championship boxing on March 3rd in Glasgow, headlined by an action-packed encounter between two world-class Super Lightweight boxers in Josh Taylor and Humberto Soto, with the winner moving one step closer to a world title shot.